“ I have been a diaconal minister for over 37 years, having been commissioned by Toronto conference on my birthday in May 1973. I had the privilege of studying in Toronto at The Centre for Christian Studies with classmates such as Marlyne Myles, Linda Ervin and Marion Jackson Tyler. They taught me a great deal about ministry and about the church. I remember being asked at my Conference Interview Board interview, whether I saw ministry as a lifelong calling and answering, “Probably not. I’ll be in it as long as I feel called by God to be there. But I don’t see the church as the only place for connecting with God. I’m prepared that God may lead me to other places than the church.” And so it is that as I look back 37 years later I am amazed and pleased that I am still being called to ministry in the church! Within that 37-year relationship with the church, I have headed in challenging directions and it has never been dull or predictable! I have worked in three congregations in Ontario for over eighteen years – two in succession after I was commissioned – and the third as my current ministry position. Through this work, history came alive for me and I saw its importance in fostering community and identity, particularly within communities which are marginalized and devalued. I was in awe of the toughness, courage and creativity of the Deaconesses who preceded me and who created an identity and a place for diaconal work within the community and the church. We know so little about these amazing women, and yet we owe them so much! I was so inspired by the potential of history that I decided to do a historical piece for my doctoral thesis. It was an exploration of the work of Methodist women in starting Sunday Schools in Canada at the time of its formation as a country, 1880 to 1920. And of course, it included a chapter on the work of Methodist Deaconesses. When the national church began its preparation for the apology to married Deaconesses who were disjoined, I was asked to write the background material which would go to Presbyteries and congregations to help them understand the need for the apology. 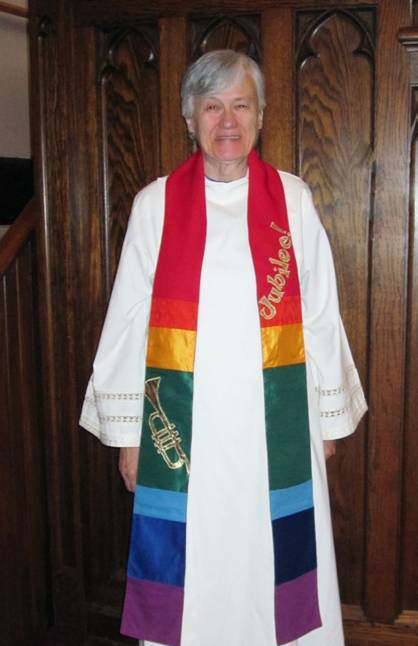 I have also worked in the National Office of the United Church for over 16 years, fourteen of them full-time. There I was involved in many exciting projects, my favorites being the development and editing of Exchange Magazine, the development and editing of two books, “Spiritual Quest” and “Arts and the Spirit,” serving as the United Church representative on the ecumenical and international development team for the Seasons of the Spirit Curriculum, and staffing the national event in Banff, Lead2004, which brought together artists and educators in a series of workshops and plenary sessions. Through all of this work I gained a deep appreciation for the regional identities and differences in United Churches across our country, and for the flexibility, inclusivity and courage of the United Church as a denomination. I met and learned from amazing colleagues in churches and publishing organizations in Canada, The United States, Germany, England, and Australia. I am spending my final years in paid ministry in a large, 179-year-old congregation in downtown Sarnia. My main areas of work are pastoral care, within which I coordinate a large and well-defined program called “Ministry with Older People”; Christian development; and outreach (shared with my colleague). Some of the gifts of the congregation which I have discovered over the two-and-a-half years I have been there are an appreciation of history and tradition, a valuing of pastoral care to the aged, an understanding of the importance of art and creativity in life and in the church, and a deep longing for renewal and transformation. All of these make my heart sing! They exist in amongst reactions of resistance and mistrust of change, a longing for the good old days of the past, and an overly-elaborate governance structure. (Do any of these sound at all familiar to you!) All of these I see as challenging dynamics and areas of work for my ministry. It is never dull or predictable. I have nurtured an arts and spirituality group, and have just finished trying out a Sunday School teaching unit which featured the use of art and music. I am currently developing a couple of adult study programs and worship resources which are based on art as a gateway into the soul, and an agent of change and movement into the future. As the newcomer to the community, I have also been able to “see things with new eyes” and to encourage the Outreach Committee to get to know the neighbors in a changing downtown context, and to dream ideas which will lead to connections and establish a presence beyond the church walls. This Spring I will be working with a small group to lead a program on learning from and moving on from our religious past. I am also working on a pastoral care seminars series on coping with change and loss, using community partners as the resource people.